Definition: Archaeology - "The study of ancient times from remains." Collins English Dictionary. 08:30. 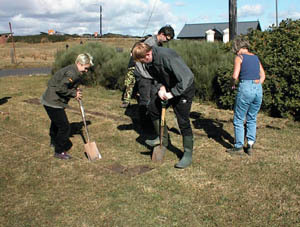 It's a fine day to begin an archaeological dig though some rain is forecast for later in the morning. 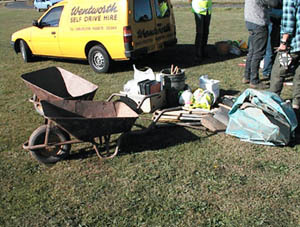 The professional members of the team are on site complete with self-drive hire van and all the essential equipment needed to make an immediate start. There is some discussion about who will do what and where to start but they are ready to go. The PortCabin hasn't arrived yet but is expected before lunch - hopefully before the rain comes. There's nothing fancy about the tools of the job, barrows, spades, buckets, shovels, hard-hats, tarpaulins, brushes, measuring tapes, string to name but a few. 09:00. 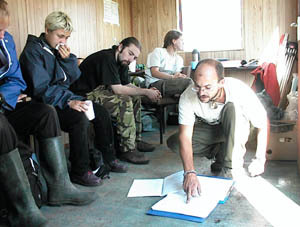 The volunteer team members arrive in dribs and drabs. Phil Abramson explains to them the strategy of the dig. 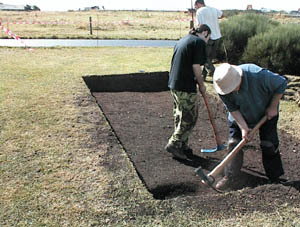 The first area to be excavated is some 10 metres south of the previous site in the front garden of the Lodge. 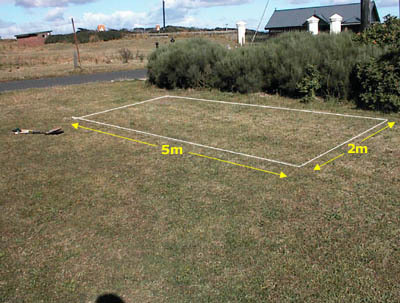 The area measures 5mx2m and is immediately outside the garden hedge of the Lodge. 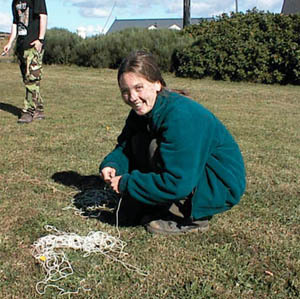 But first the area must be marked out and the first setback arises - the string needed to mark out the ground is badly tangled. Jo draws the short straw and gets the job of unravelling it. 09:30.Everyone has arrived now. 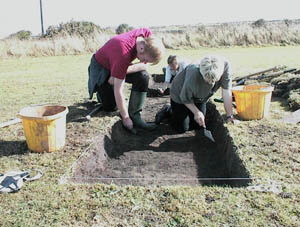 Jo has untangled the string and marked out the area of the first excavation. Phil has told the group that other areas about 2mx1m to 5mx1m will be selectively excavated across the large area of the Flower Show Field which stretches from the Lodge across to St Mary's Church. 09:40 "Right", shouts Niall, "it's time we were started". So they did, but only slowly at first. There hasn't been a lot of rain this summer and the ground is exceptionally hard. The turf is to be removed first and it will take some hard work to remove it. Rumours that a JCB digger would be used were quickly quashed by Niall. Elizabeth and Claire soon discover that the most effective technique is to jump up and down on the spade. This phase is tough for everyone though the soil beneath appears to be light and sandy and should be easier to remove. 10:30 The portacabin arrives - before the rain! 11:00 Jo, Claire and John start a second trench 5mx1m at the southern side of the site. Several other positions are marked out for attention later into the investigation. The whole Flower Show Field has previously undergone a magnetic and electrical resistivity survey and the second trench is positioned to investigate what looks like an old trench or ditch. 14:45 "And the rains came down and the floods came up". Thank goodness for the portacabin when the heavens opened. "At least we'll have a rest from the digging." thought Trevor but not about to admit it. No such luck. At 15:00 Jim began a teach-in which brought home to everyone that the simplicity of the archaeological tools belies the detail and sophistication of the questions which will be asked of any finds that may be made. in her mouth after sampling Dig99 coffee. There are forms to complete and records to be made to describe any item, its physical condition,its orientation, the environment in which it was found and much more. Listening to Jim talk it becomes clear that he has a grasp of human physiology, dentistry, physics, geology and town & country planning. The knowledge of the archaeologist is broad indeed. 15:30 The skies have cleared and its back to digging again. 16:30 Good progress has been made on both trenches but, as yet, nothing exciting to report but tomorrow's another day!